The Sims franchise is notorious for DLC and expansions, and The Sims 4 has only ramped that up. I have never had a problem with this as I have always been able to pick and choose what I wanted to have and not having something didn’t affect anything else in the game. With the My First Pet Stuff DLC that has changed and I fear it may lead the game down a very scary and dark path. My First Pet Stuff pack is a fun and unique little pack that gives you four different little critters to own, such as pygmy hedgehogs, rats, miniature bubalus, and hamsters. While they can be a fun little diversion for the day to day of your Sims’ lives, they ultimately do not do much and only add maybe a couple hours of gameplay if you are lucky. They all use the same basic cage, and cannot roam your house in balls or freely; they are either being played with by your Sim or are in their cage. They do have their own basic lives and will play and have fun in their cage which is fun to watch for a bit, but ultimately do not bring a whole lot of gameplay to the game. I can live with these small gameplay choices if the pack was not hiding something more sinister. Along with the small pets come some new items which is always great, except to use a lot of them you must own the Cats and Dogs expansion. This pretty much makes My First Pet Stuff DLC for DLC. It is mind boggling that they chose to make this the case. There are new outfits for cats and dogs which require the expansion pass to play. There are also new items for your home such as pet beds and food bowls that can be added to your house, but without Cats and Dogs there is no reason for them and they cannot be interacted with, making them pretty much useless. 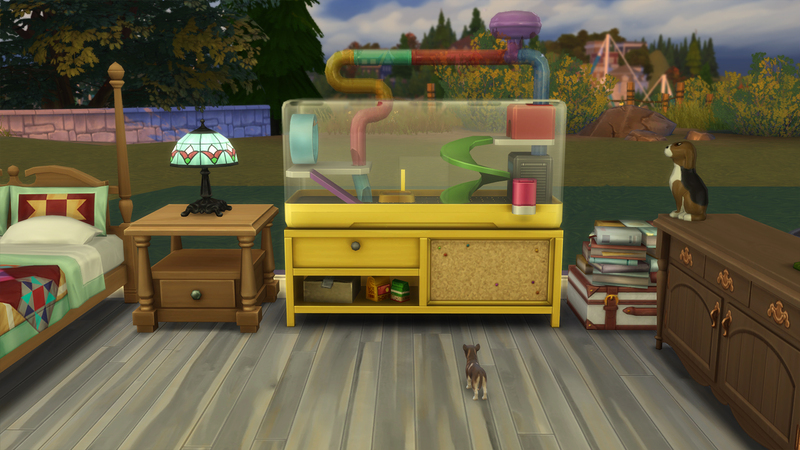 Through all the new items I only found two I would use on a normal gameplay, which were the small pets and a fish tank table that I would use if I didn’t own Cats and Dogs. Sure there are a couple hairstyles and some Sims clothes, but nothing that I personally fell in love with. This is the biggest downfall of My First Pet Stuff, there is simply not a lot of things in it, and most of them require Cats and Dogs to be used. The little critters are nice and I love the fish tank table, even though it is non-interactable and you cannot feed, clean, or change the fish; it is just a table that has fish in it. This is a major problem and quite frankly a scary direction they are taking it. Making new DLC require old DLC to be fully utilized has never happened in The Sims before and to be frank I hoped it never would. It is a slippery slope they are on and if they continue this they could alienate fans and potentially make gamers quit buying the Sims games to avoid this kind of hustle. If it was a one off thing I can understand them trying something, even though I do not feel it works or is a good idea. But if this is going to become more standard, expect major backlash from the fans and a very rocky future for the franchise. Since this has never happened before either, I am waiting to hear from fans that bought this $10 pack who don’t own Cats and Dogs to only get a handful of items, a new little pet, and a bunch of stuff they can’t use. This feels like a way to get people to buy Cats and Dogs after buying this pack which feels shady and unprofessional. I love and admire The Sims and the devs, but I think they really messed up on this one. If we start seeing more instances of this, such as a new pack that adds in a new social group but only if you have Get Together, I will become very fearful of the future of The Sims and I feel other players will feel the same. However, my biggest complaint is that all this pack contains should have been included in the Cats and Dogs expansion to begin with. Previous Pets expansions have always had small pets included. The few new items such as pet clothes and pet furniture are nice, but frankly there isn’t that much and could’ve been in the expansion or even a free update for the expansion owners such as the way pools and toddlers were added. I was very disappointed in this pack and felt like it was just the stuff that got cut from the expansion and brought back to make a little money. Not to mention four animals that are pretty much the same with different skins doesn’t justify the price. My First Pet Stuff adds basically a new critter, some hair and clothes items, and items that require Cats and Dogs. It is DLC for DLC and feels like this all could have been part of that expansion instead of its own stand alone product. I am disappointed in the lack of items, the reskins of the critters, but most importantly how they thought doing a pack that requires another expansion was a good idea. It is not worth your time, and in my opinion we should not support a practice like this and hopefully let them get back to making great packs like they were.